Never thought I would write about the connections of Adolf Hitler, Benedict Arnold and Thomas Jefferson, but they have come together in my life. Here’s how the world’s most infamous murderer, America’s most famous traitor and the author of the Declaration of Independence have become connected, and how you can help to separate them. Like many authors who have books available on Amazon, I addictively check on the status of my books in Amazon’s myriad best seller lists. The lists update hourly and I can’t help but take a peek for changes every hour. This is especially true when I have a new book like Creating the Declaration of Independence, which follows Jefferson around Philadelphia in June, 1776 just before he sets about drafting the document that launched the United States. Amazon ranks Creating the Declaration of Independence in three categories. 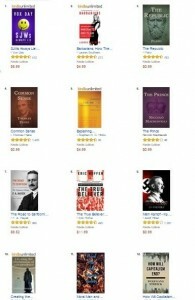 The book is doing well in all three, particularly in Political Philosophy and American Revolution and Founding. In Political Philosophy it’s #10. In American Revolution and Founding it’s #20. 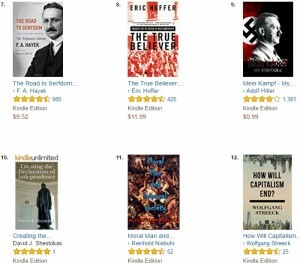 In Political Philosophy, book #9 is Adolf Hitler’s manifesto, Mein Kampf. 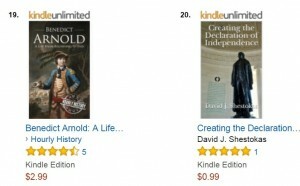 In American Revolution and Founding book #19 is Benedict Arnold: A Life From Beginning to End. 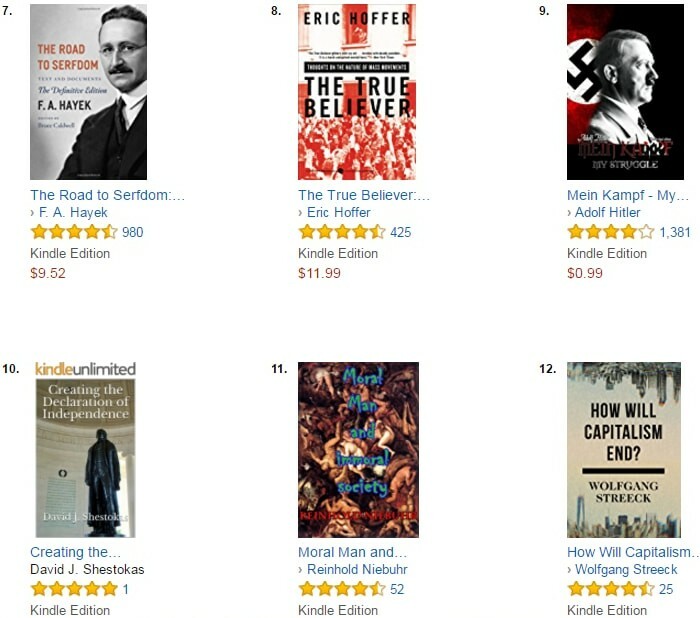 The lists display the covers of the ranked books. Creating the Declaration of Independence shows the magnificent Jefferson Memorial rotunda statue. You can help correct this incredible injustice with a one time investment of 99¢. You can help move Thomas Jefferson past Adolf Hitler and Benedict Arnold for just 99¢. Buy Creating the Declaration of Independence (it’s only 99¢). You can really help move Jefferson way past these two members of the Infamy Hall of Fame with a 5 star review. Enlisting your friends and contacts in this effort is also crucial to its success. Once Hitler and Arnold are in Jefferson’s rear view mirror, there is still work to do. Ahead of the author of the Declaration of Independence in Political Philosophy are Plato, F. A. Hayek, Niccolo Machiavelli and Thomas Paine. They need to be looking at Jefferson as well instead of the other way around. These rankings update hourly, so a momentary improvement for Jefferson is not necessarily permanent. The need for your aid is ongoing. So click HERE to advance Thomas Jefferson’s Amazon ranking for just 99¢ right now! Probably most authors do this, but no doubt many deny it. And Richard Henry Lee and John Adams. 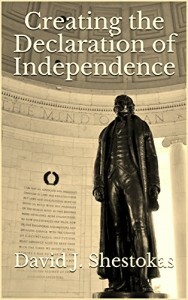 For folks with a Kindle Unlimited subscription you can read Creating the Declaration of Independence for free. These rankings update hourly, so a momentary improvement for Jefferson is not necessarily permanent. The need for your aid is ongoing. Dave crafts such a great story. His material always centers around a group of people unparalleled in the annals of human history—the Framers—and in particular, Thomas Jefferson. Personally, I consider Jefferson the greatest pure human to ever walk the planet (recall Christ was both human AND divine). I am always humbled when reading about the intellect, integrity, and honor of these great men and wish we had individuals 1/10 of this caliber to lead our once great nation now. In his book, Dave weaves together the events leading up to the creation of one of our sacred founding documents. He places the reader in the midst of the actions and thoughts of the Framers and provides a “worm’s eye” view of the events that took place in the days leading up to July 4, 1776. For people who care about the birth of America and want to learn how and why it all came about, this book is an excellent resource. Wow, what an original idea? Hollywood should snap it up for a docu-drama, or they should make an episode on “Timeless” about those people who revisit the past. And it turns out that attorney David Shestokas is apparently a huge expert on the Declaration of Independence. This is a fascinating (and unknown) bit of our history, presented in a fascinating way. I like it.